Sanding Booths - Marathon Finishing Systems,Inc. Marathon’s Sanding Booths are Maecenas imperdiet accumsan vestibulum. Aliquam erat volutpat. Mauris eget tincidunt ligula. Integer non lectus nec magna venenatis mollis. Duis varius posuere massa, et condimentum turpis posuere lobortis. In semper lectus eu diam semper, ultrices iaculis ipsum faucibus. Fusce id justo odio. Maecenas tempus libero sem, eu mollis neque porttitor non. Curabitur fermentum nisi id tristique luctus. Quisque vel aliquet eros. Etiam porttitor mattis sagittis. Sed dui nulla, congue sit amet lacinia mattis, blandit eu sapien. Donec vitae lectus mi. Donec tempus neque sem, id eleifend felis commodo ut. The Sanding Booth is an excellent “All Around” paint booth, and is also one of our most popular styles. 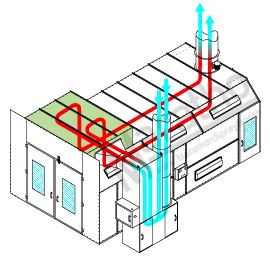 The air enters through the intake plenum above the front doors, and travels horizontally through the booth.